Urethane flapper valves are used in a great number of industries such as the marine industry, power and desalination, paint and adhesive, fire and water industry. At Plan Tech, our urethane flapper valves are corrosion resistant and are used for gravity flow systems. 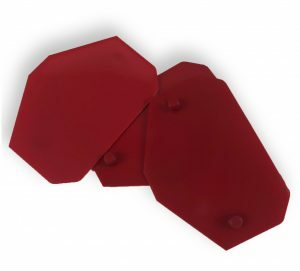 In addition, Plan Tech offers custom-made urethane flapper valves to meet the international standard requirements and also the specific needs of our clients. We are focused on using speed and precision in order to produce the highest quality urethane flapper valves for our clients and customers. Plan Tech has the best production services in the world including dedicated TDI and MDI production cells. FDA Urethane Additives: Eriez POLYMAG® a leading manufacturer of Metal Detector systems, allows urethane molders to produce FDA Metal Detectable and X-Ray Visible urethane parts for food contact applications that can satisfy varying levels of detectability. Acceptable for repeated contact with food under section #177.21000, subpart F. Can be used in continuous and repetitive contact with dry, aqueous and fatty foods. Typical features of these polyurethanes include outstanding abrasion resistance, high tensile and tear strength, and excellent load bearing capabilities. Are you interested in cast Urethane Flapper Valves? Please Contact us so we can help solve your requirements and work with you on your specific application!